An engagement ring is more than just a pretty gem, it is also the precious metal that holds that gem in place. Knowing the benefits and attributes of different metals can help couples choose the perfect metal to complement the diamonds or gemstones in an engagement ring. Some rings are even combinations of different metals, such as multi-tone rings or specialized mokume gane rings. Each type of metal has its own unique properties, including different levels of strength, durability, resiliency, and tension. By choosing a metal that not only has the most desirable properties but one that is also beautiful, couples protect both the style and construction of the engagement ring. Will this metal be secure enough for the stone and setting? Many rings opt for platinum for the actual setting because of its greater strength, but the band should also be strong enough to withstand any daily stresses. The security of the setting also dictates the type of metal. Will the metal discolor the diamond or gemstone? Yellow or rose gold may impart a subtle hue to the stone, particularly if it is not impeccably colored to begin with. At the same time, white metals such as platinum or silver may help brighten a stone with a lower quality color. Is the metal within our budget? Uncommon gold colors such as rose gold or rarer metals such as tungsten are more expensive than easier to acquire yellow gold. Is the karat value suitable for our preferences and budget? Lower karat metals actually have less of the precious metal in them, though they do make the metal stronger. Most gold engagement rings are 14 or 18 karat gold, and higher values are generally more expensive as well as less durable. 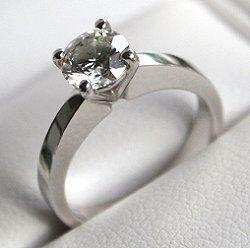 Regardless of which precious metal a couple chooses, it will set the stage for the gems of the engagement ring. By choosing a distinctive metal with suitable properties to highlight and secure the gems, the couple ensures that their ring will be both enduring and beautiful.